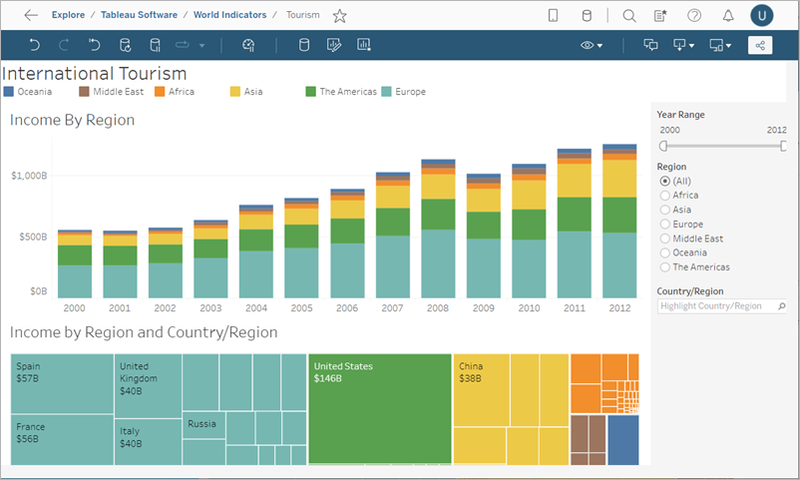 In Tableau Server and Tableau Online, content pages show projects, workbooks, views, data sources, and flows (Tableau Server only). Shared content pages show all the content that you have access to on the site, including content you have added. Your private content page shows the specific content you own. The content and options you see are based on your site role and content permissions. 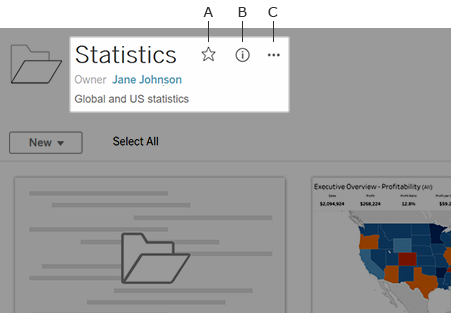 When you sign in to Tableau Server or Tableau Online, you will see a page listing the shared content on that site. 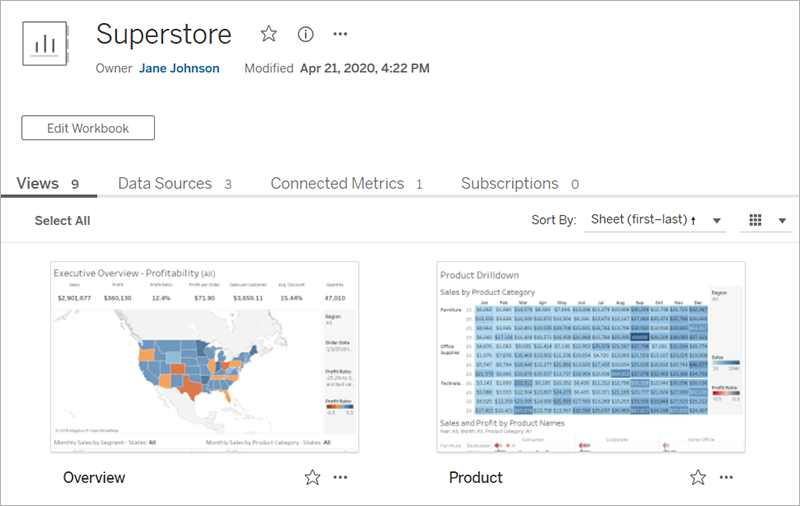 You can filter, sort, or search this aggregate content to show specific content types or to find content owned by a certain person, created after a certain date, or belonging to other criteria. At the top of each content page, you can see the name of the content, the content owner, and a description of the content, if one exists. Some types of content may show additional information, such as the date the content was last modified. A - Add the item to your favorites. B - View the item’s details. C - Perform actions on the item. If you own the content and have appropriate permissions, you can edit the item’s details. Click the details icon to edit the description, change the owner, and more. 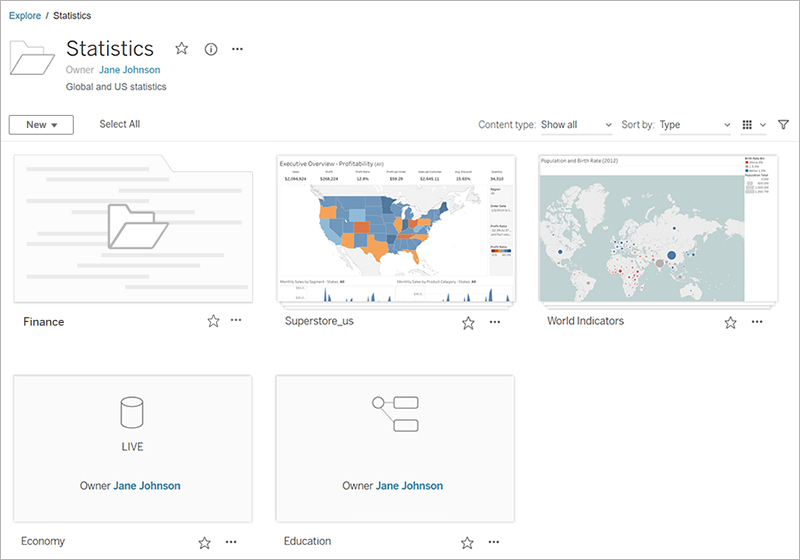 By default, a project page shows all the content that is part of that project, including workbooks, data sources, and flows, as well as any nested projects. To find the items you are looking for, you can select the content types you want to see, and you can filter and sort the content within the project. A workbook page includes the views and data sources used by the workbook. It also provides a list of user subscriptions to the workbook and its views. A view page displays options for interacting with the view, including sharing, subscribing, and editing. 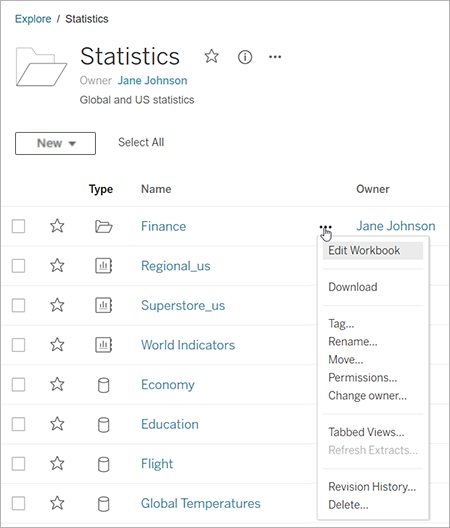 A data source page shows connections, refreshes, and connected workbooks. 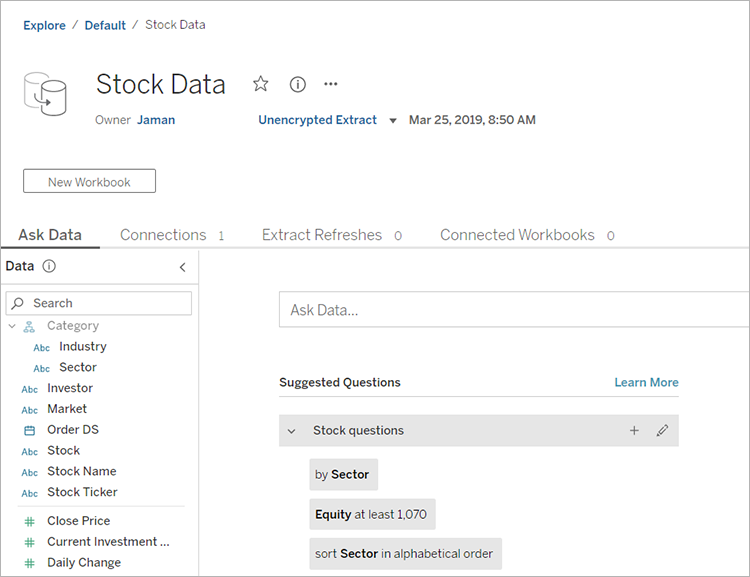 You can use Automatically Build Views with Ask Data to investigate questions about your data. 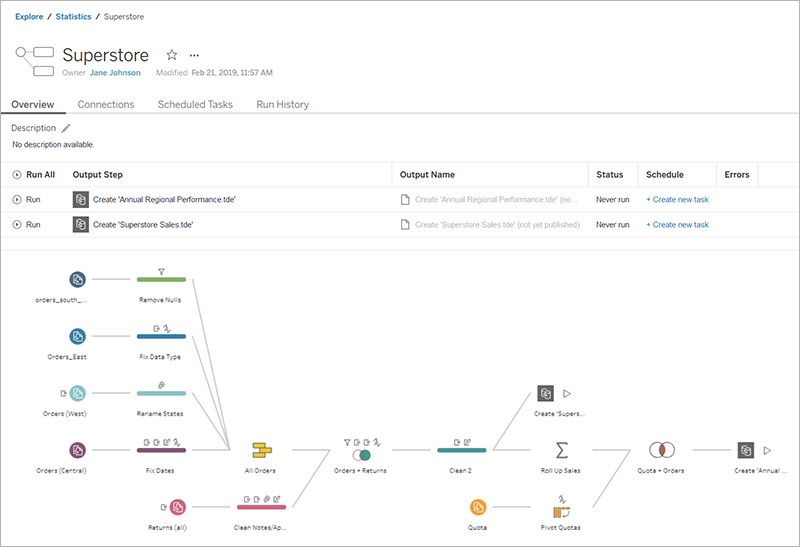 Schedule and manage flows to run automatically to update flow output data. 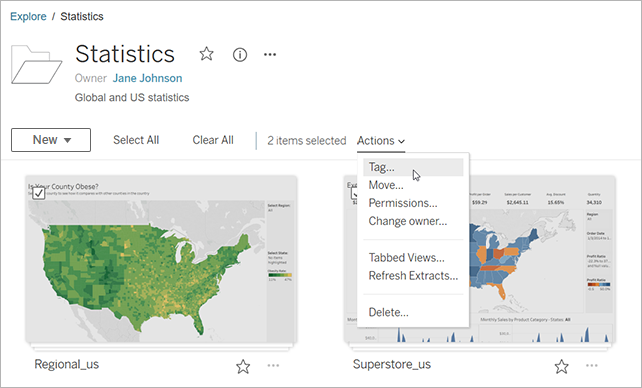 To see and work with flow files in Tableau Server you must have the Data Management package included with your Tableau Server installation and Tableau Prep Conductor must be enabled. 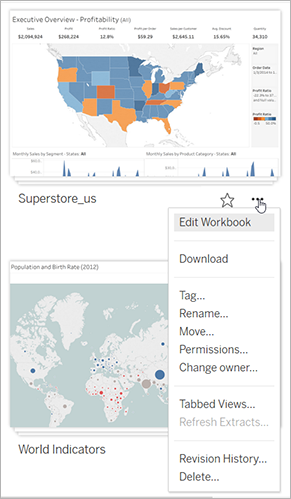 For more information about working with flows, see Keep Flow Data Fresh in the Tableau Prep online help. To see the content you own, click your profile image or initials at the top of the page, and then click My Content. Your content page includes your user information, the workbooks and data sources that you own, your subscriptions, and your account settings. Click Settings to go to your account settings from your content page. Click check boxes to select content, then click the Actions drop-down menu to access commands available for that content. In you don't have permission to perform an action on the content selected, the action will be disabled. If you select multiple pieces of content, and you don't have permission to perform an action on one of the pieces of content selected, you will get an error when you try to perform the action on that content. Note: Different content types have different actions available. 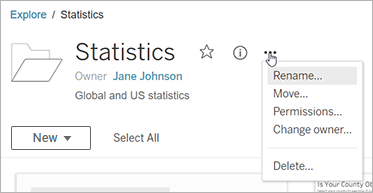 If you select more than one content type, for example, selecting a workbook and a data source, the actions you see will be limited to those in common between the types. In thumbnail view, you access the Actions menu from the lower-right corner of a thumbnail. In list view, you access the Actions menu to the right of the content’s name. You can perform actions on the content you currently have open by clicking the … at the top of the page.